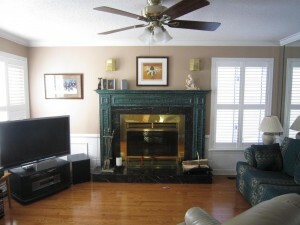 This original wood burning fireplace had a raised marble hearth and surround. The wood mantel had been faux finished to resemble green marble. My clients wanted a gas insert and a cleaner, more modern silhouette that would fit the scale of the room better. A flush slate hearth helps to make the room more spacious and the smaller brick slate surround keep the look more contemporary. 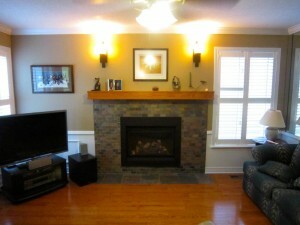 The simple wood mantel was custom made and finished to match the wood floors. Adding two new sconces completes the look and repeats the black finish of the gas insert.